Sometimes life gets in the way of my hobbies! ... and the longer you leave things, the harder it is to get back to them. This is only the second card I have made since my shoulder operation and I have to say I am finding it hard to get back into the swing again. Fortunately, a friend asked me to make a card for her Sister's 50th birthday and that was probably just the spur I needed. The Sisters are fanatical Richmond supporters so I just had to run with that theme. I turned to the "card in a box" design which is always so well loved, and I hope it will fit the bill this time too. I am trying to get motivated to return to blogging and I found this post in my drafts just sitting there since the end of June, waiting for the photo to be added. 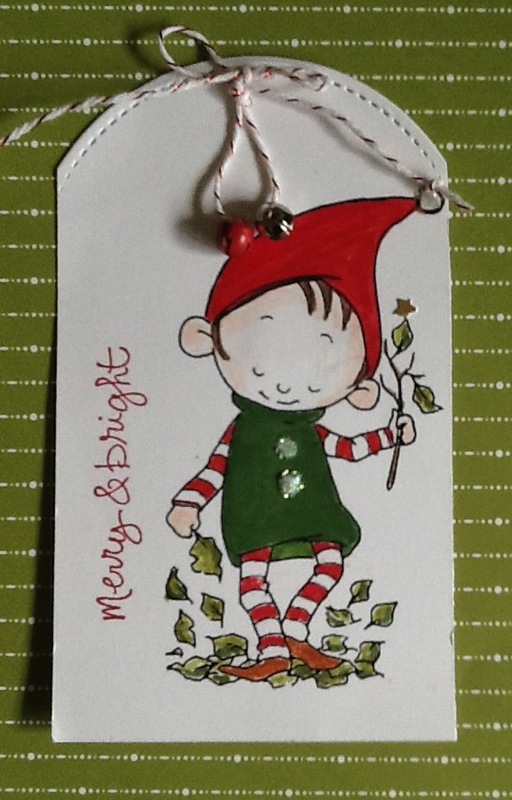 Phew, nearly forgot today's tag as I was busy making Christmas cards for my overseas family and friends. Got them all in the mail too, so really pleased about that. So the tag for day ten came about when I found the concertina already made up. It seemed the perfect spot for a couple of little gold embossed ornaments to hang from. .... another simple one for day nine. 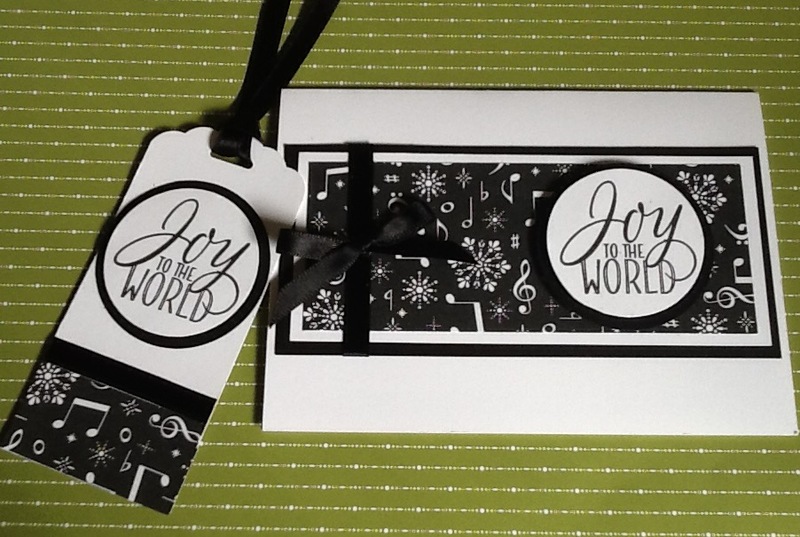 Today's tag is clean and simple and ready for any type of package. The reindeer looks quite lovely embossed in Copper. 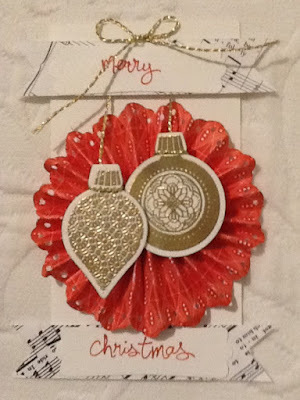 A layer of copper foil was added under the white to give a touch of elegance. Not seven swans a-swimming but seven red and white tags ready to adorn some Christmas goodies. Will it be biscuits or will it be chocolates?? Whatever the choice it's sure to be yummy. This little elf has been sitting on the shelf far too long. He is from a digital image I have had for ages. I had printed a couple out and thought he was just perfect for Christmas. I think he is very cute. I hope you like him too. 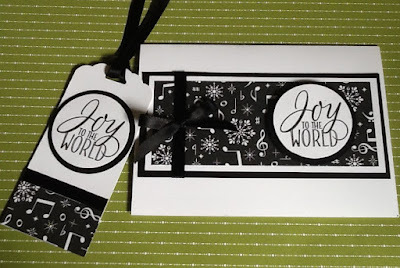 Today's tag is part of a set which includes card, tag and little milk carton type box. The beautiful black and white paper is from SU Merry Music pack and as the name suggests has lots of music sheets and notes etc. 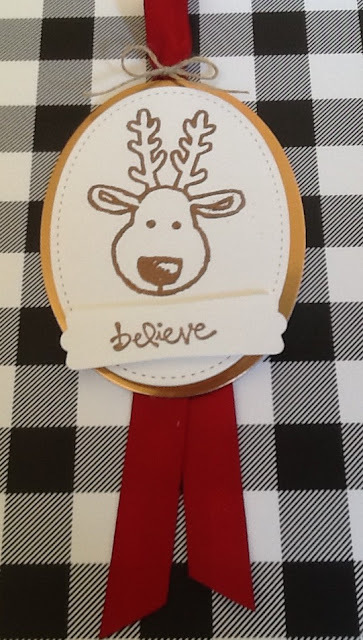 A very simple tag to make in bulk if you end up making them at the last minute, but the sentiment makes it work. OK, it's only the fourth day and I am behind again, but not giving up just yet. 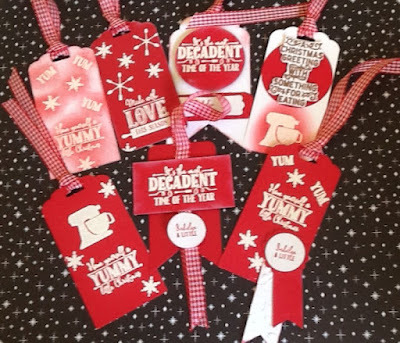 The idea for this tag has been in my brain since the Cookie Cutter set came out last year. 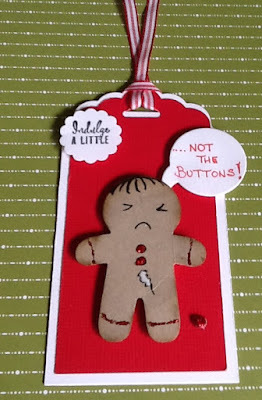 Following on from viewing the Shrek movie, every time I see a gingerbread man in any form, I immediately think "not the buttons" and I am sure this one will be for my Son.